Having a ball with division! This week, Katie’s SchoolPlus homework continued with the topic of division. She had a worksheet with 25 division problems, going up to numbers as high as 30. After some deliberation over how to handle this, I decided that the involvement of dolls was essential. Predictably, Katie became very excited when I suggested that the dolls have another ball. “They haven’t had one in such a long time!” she exclaimed. I told her that while having a ball, the dolls were going to help us solve some math problems; she didn’t object. Our first problem was 9 divided by 3. 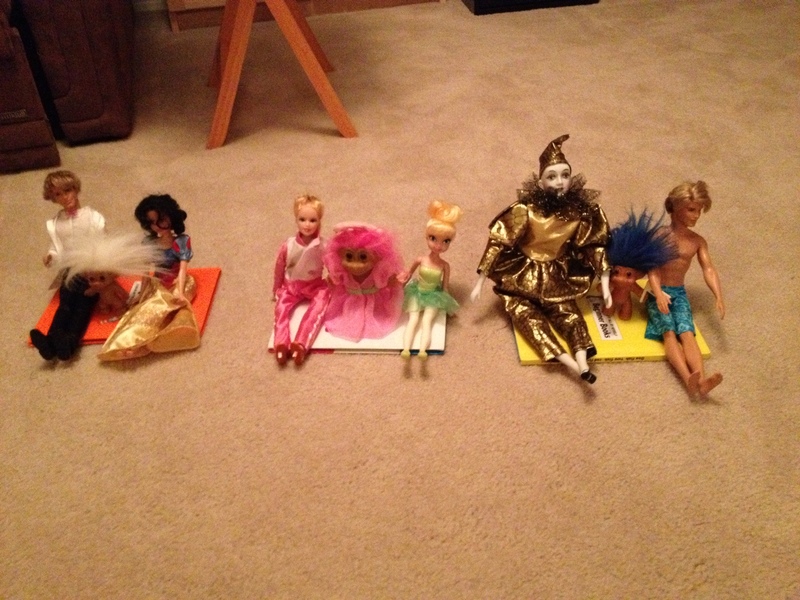 I told her to pick out 9 dolls, meanwhile arranging 3 books on the floor to serve as benches. She had to sit the 9 dolls on the three benches so that all the benches had an equal number of dolls sitting on them. The concept posed no problem, but much effort went into deciding which doll would sit on which bench. The next batch of problems were solved in a similar fashion. After a few divisions by 1, she was able to do those without the help of the dolls. At some point we started encountering problems where the dividend was greater than 20. We didn’t have that many dolls readily available (there are certainly that many in the house but I wasn’t willing to spend time gathering them), but we did have many mancala stones. Also, I thought that it would be a good idea to vary the setting a bit. So now we were dividing stones among the dolls. After solving many problems in this way, I decided to test out whether she really understood the concept. When we again encountered a problem with fairly small numbers, I suggested that we go back to sitting dolls on benches. The problem was 6 divided by 3. Katie decided that we needed 3 dolls and 6 benches. I tried telling her that now the role of dolls is replaced by benches and the roll of stones is replaced by dolls, but she kept insisting that the number of dolls was always the smaller one before and so it should be the same way this time. Finally, I told her to solve the problem however she thought fit (I really should have done this right away without saying anything, but it’s always easy to spot mistakes in retrospect). She put out 6 books and was about to pick out the dolls. Suddenly, she stops and says “Wait, I’m confused, how can we put 3 dolls on 6 benches? That won’t work!” And then she proceeds to take away 3 of the books and place 6 dolls on the remaining 3. Victory! Here are some concluding thoughts. As is often the case with such things, the process rather than getting the answer was what made it fun for Katie. 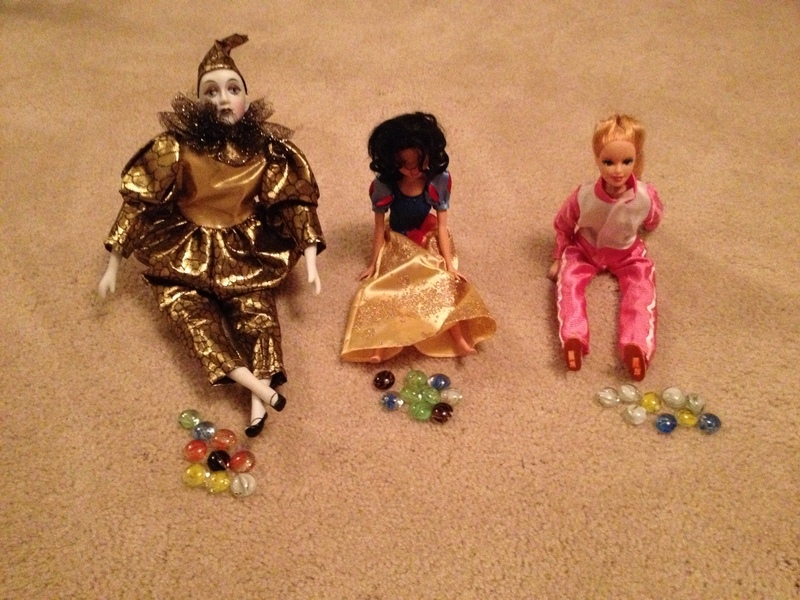 What she enjoyed most was picking out which dolls would participate for each problem, how to arrange them, and which colored stones they would get. However, the goal of understanding division was achieved. The last problem of the worksheet was 4 divided by 2. Upon seeing it Katie exclaimed, “That’s easy!” and proceeded to write down the correct answer. No props were necessary. This entry was posted in Uncategorized and tagged division, dolls. Bookmark the permalink. 3 Responses to Having a ball with division! Love it. Your creativity at its best. BTW did you introduce her to formal way of writing division. Not that it is necessary at this point, just a question out of curiosity. The worksheet had all of the problems as formal division. I’m generally not thrilled with these types of assignments, especially for an enrichment class, but I think that I made the most out of it. I like how you turned a not-so-great-for-5-year-olds assignment into an opportunity to help her actually understand division! By the way, we got the Beast Academy (3A) books earlier this week and I’m quite impressed by them! They’re really different from all the other math workbooks I’ve seen for kids, even the ones that claim to be for gifted/advanced kids. There appears to be almost nothing rote, and there’s lots of problem solving and thinking outside the box. They seem to directly target potential areas of misconception (e.g., defining a square as a shape that is both a rhombus and a rectangle, defining equilateral as any shape where all the sides are equal length — of course that’s true but I never really used the word equilateral with anything but triangles?) From what I’ve seen of the workbook, they also try to help kids identify patterns (beyond the normal skip-counting) and generalize. For example, one problem is with regular heptagons – what’s the perimeter of one regular heptagon with side length 1 (7)? If you fuse on another heptagon so that it completely shares a side, what’s the new perimeter (12)? What if you fuse on another in the same way? What if 8 heptagons are fused together? You might want to check it out. Even David, who is a little less than four years old, is quite interested and can follow along with the guidebook (really a comic book featuring math) and think through some of the problems. He asked for it as his bedtime story tonight! It seems like Katie has already covered most of what is considered grade K-2 in many schools (lots of arithmetic?) anyway, so I bet she’d be ready, especially if you’re there to facilitate.